A compendium of thoughts, essays and reviews regarding books and contemporary matter. 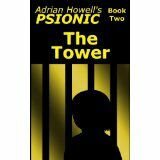 The Psionic series is a pentalogy revolving around a highly detailed world of humans and Psionics. Psionics refer to people who have acquired extra mental capacities such as telekinesis, mind control and a whole range of completely original abilities too. The Pentalogy follows the story of Adrian Howell who coincidentally shares the name of the author. (Henceforth if I refer to Howell I mean the author and Adrian, the character.) After initially discovering he has the power of telekinesis he is plagued by headaches sent by an agent of the Angels. After his parents are murdered and his sister goes missing Adrian is alone with two rival factions vying for his allegiance. Books one and two explore the finding of his new powers and how he adjusts to live without the family he has grown up with. He develops strong bonds with Cindy and Alia and accepts them as a kind of new family but he never stops hoping for his lost sister Cat. Foolish mistakes and an escalating level of danger lead Adrian to claim he will never put himself in a dangerous situation again. Of course, that doesn’t last for long. 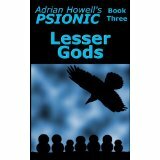 Lesser Gods picks up soon after Book Two finishes. Adrian is starting to go on missions for the Guardians in the Ravens team. However a mission goes awry and Adrian finds himself once again in captivity. Howell doesn’t spare any details here. The reader is treated to detailed descriptions on all the suffering and abuse Adrian suffers at the hands of his captors. The second part of the book feels almost as though it should be a separate book altogether considering all the suffering and healing Adrian has to go through. But really it is a long crescendo that doesn’t really slow down until the end of the book. The series feels as though it has really been building up to a showdown between the Angels and the Guardians and the blood-trial is the first real taste of large scale action. This isn’t just a mission with a few highly trained individuals, this is two factions in the same living space. Howell builds the scene for the trial well and the … events that ensue don’t skimp or detail or tension. On a personal note, this is my favourite of the series so far. You know you are reading a good book when you race through it to find out what happens and then feel slightly disappointed at the end because there’s no more to read. I consoled myself with the fact that I still have two more books to go and the war is really heating up now so I will get straight onto them. As always the style and quality of writing is excellent showing that self-published fiction can be just as worthy of shelf-space and readers’ time as anything produced by the Big Six. The complete series is now available for download via Amazon. If you want to know more about the author or the series you can read Howell’s blog here. It is not written in character but he has retained his pen name for the time being. There you will find details and links to all of the books in the Psionic Series and more detailed information about the author and contact details. Books read so far… Not that many! Is Dracula the Angel of Death?